THE news that the Virgin Trains East Coast franchise is to end three years early in 2020 has been greeted enthusiastically by investors. Stagecoach shares ended last week 12 per cent higher, and the price had risen by a further 1.67 per cent or 3.0p by 11.45 today (Monday), with each Ordinary share valued at 183.0p. The troubled franchise is to be replaced by a form of regional partnership with the DfT and Network Rail with the aim of ‘bringing together the operation of track and train under a single leader and unified brand’. Discussions are already in progress, the DfT has revealed. Transport secretary Chris Grayling ignited a storm of criticism when he announced this change of plan as part of wider announcements about rail policy on 29 November. 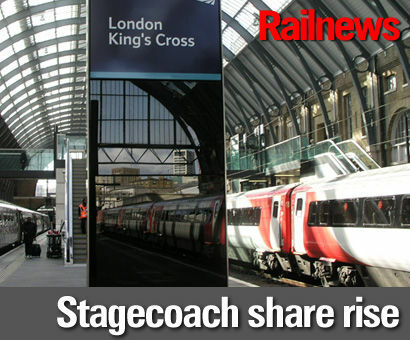 The East Coast contract is currently held mainly by Stagecoach Group but Virgin Rail Group has a 10 per cent stake and lent its name for the franchise brand. The total premiums payable over eight years would have amounted to £3.3 billion, or £2.3 billion at 2015 values. Operations began on 1 March 2015, when Stagecoach and Virgin took over from the publicly-owned East Coast Trains. This had been the successor to National Express East Coast when that company withdrew on financial grounds in November 2009. However, National Express was not the first East Coast casualty. It had replaced the second GNER franchise, which also foundered. In each case, the premiums promised proved to be unachievable. The present Stagecoach/Virgin franchise has been following this trend. Although Virgin Trains East Coast presented a brave public face, Stagecoach was forced to admit in June this year that it was facing what critics described as a ‘black hole’ at East Coast of £84 million, and that it would seek to renegotiate the terms of the contract. At the time, chief executive Martin Griffiths said: “The franchise will have to be reset because the terms and assumptions no longer apply,” but the DfT responded unsympathetically, saying that it expected Stagecoach to ‘honour its financial commitments’. Reasons for the revenue shortfall were said to include the late arrival of Intercity Express trains and infrastructure failings attributed to Network Rail. Martin Griffiths described Mr Grayling’s new partnership strategy as “a clear statement of intent to seek to negotiate new terms for the East Coast franchise, and we are hopeful of reaching an agreement through to 2020 within the next few months”. Had it continued, the eight-year East Coast franchise could have come under further pressure in 2021, when FirstGroup is due to launch five daily open access services on the route between London and Edinburgh. Previously, GNER had blamed the arrival of Grand Central open access services between London and Sunderland in 2007 for helping to bring its second contract down.